Dwayne Haskins (2,801 yards, 30 TD passes) could have another big day against a Nebraska pass defense that ranks No. 111 nationally and allows 272 yards a game. Nebraska freshman Adrian Martinez has 1,656 yards passing and 11 touchdown passes and 408 yards and four touchdowns rushing. J.K. Dobbins’ last two games illustrate Ohio State’s difficulties running the ball. He has rushed for only 59 yards in those games (35 against Minnesota, 24 against Purdue). His lowest total in back-to-back games last season was more than twice that at 139 yards. Nebraska’s Devine Ozigbo has rushed for 710 yards and eight touchdowns. But maybe the thing that should concern an OSU defense that has struggled to contain big plays all season is that he has nine runs of more than 20 yards. 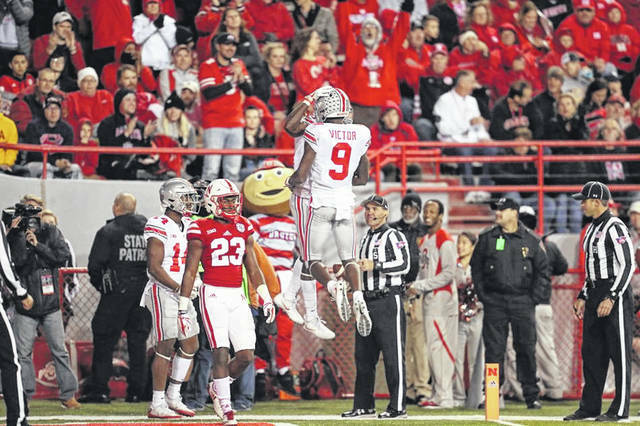 Binjimen Victor is expected to get more playing time after Austin Mack’s foot surgery to repair a non-contact injury during OSU’s 49-20 loss to Purdue two weeks ago. The Cornhuskers’ offense is the strength of their team and wide receiver might be the best part of that offense. J.D. Spielman has 53 catches for 686 yards and seven touchdowns. Stanley Morgan has 44 catches for 638 yards and five touchdowns. Ohio State has given Haskins time to throw in most games but has not gotten running backs into the second level of defenses for big gains. Nebraska’s line has done a better job run blocking than pass blocking. The Cornhuskers average 5.5 yards per rushing play but have allowed a Big Ten-worst 20 sacks. The numbers say Ohio State’s front four has missed Nick Bosa. OSU’s defensive linemen, including Bosa, had 10 sacks in the three games he played. In the five games since then, the defensive lineman have combined for only 6.5 sacks. For Nebraska, end Ben Stille has five sacks and the other end, Freedom Akinmoladun is a three-year starter. Former Buckeyes linebacker James Laurinaitis said on a recent podcast that OSU’s linebackers are “special athletes” and that lack of athleticism is not the reason they have struggled this season. Nebraska’s Luke Gifford has 5.5 sacks and 10.5 tackles for losses. Mohamed Barry’s 75 tackles leads the team and Dedrick Young is a four-year starter. Ohio State has had five defensive backs taken in the first round of the NFL draft since 2016. This year there are no Buckeyes DBs showing up in early rounds in mock drafts. Nebraska cornerback Dicaprio Bootle leads the Big Ten with 14 pass break-ups. Ohio State’s big question is who kicks field goals, Blake Haubeil or Sean Nuernberger, if Nuerberger has recoved from a strained groin. Nebraska’s Barret Pickering is 7 of 11 on field goals with a long of 35 yards. Spielman has a punt return for a touchdown.